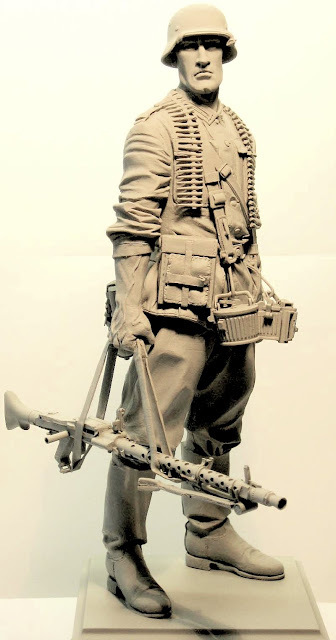 Jeff’s latest 200mm German figure will surely not disappoint his fans – It is an early war Gunner figure – carrying a fully loaded MG 34 light machine gun. These were real breakthrough weapons of World War two and could fire 7.92 mm Mauser cartridge at a rate of 850 rounds per minute with a unique interchangeable barrel assembly. Machine Gunners of this period were usually well trained with their weapons and were valuable soldiers on the battlefield for the Germans. 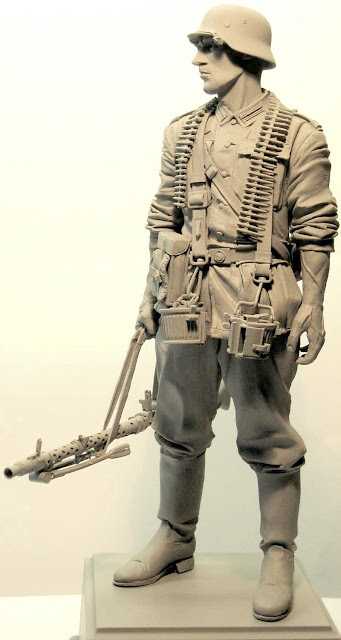 This figure - titled ' WWII German MG34 Machine Gunner 1941', has eighteen parts of grey resins which not only make up this awesome gun but it’s parts and of course it’s user the gunner. In high jackboots and summer tunic, he is wearing an M40 steel helmet a pouch of tools for his machine gun. He also carries two spare round ammo containers along with the “scarf” of 7.92 mm ammo around his neck. This figure is available on Jeff’s website - he has some other pretty impressive works for sale as well so have a look! Items are typically shipped within 1 - 2 business days after receipt of payment. He can combine shipping, please inquire about shipping price for multiple items.